A blazing fire on Friday, March 24th in Caye Caulker Village gutted the second level of an apartment building. The fire, which started sometime in the afternoon is believed to have originated from a small wooden house adjacent to the building. According to reports, local authorities have since launched an investigation focusing on arson as the possible cause of the fire. 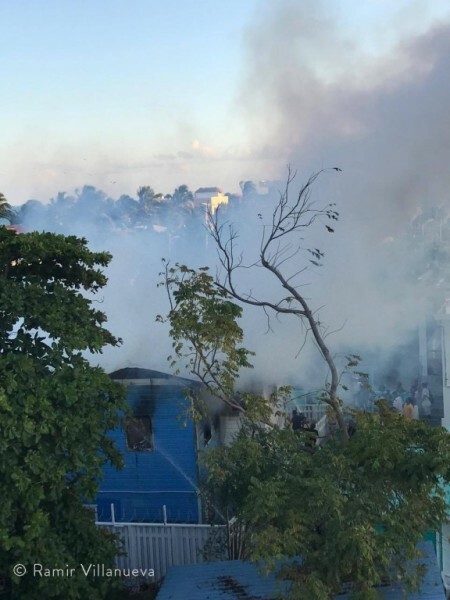 Reports indicate that the Caye Caulker Fire Department responded to a house ablaze located on Front Street, near the island’s police station. The two-story building with a concrete first level and a wooden second section was occupied by five persons in three different apartments at the time of the fire. No one was injured and they were able to save some of their belongings on their way out. Most of the fire victims are staying with family members and friends on the island. According to eyewitnesses, the fire spread north-ward from a small wooden structure near the apartment building’s fence. A shack that was known to be used as a storeroom. The San Pedro Sun was informed that no one was reportedly living in the aforementioned small structure, and neither was it connected to any power lines. The mystery of the incident has authorities baffled, and they are looking at the possibility that the blaze was intentionally caused. 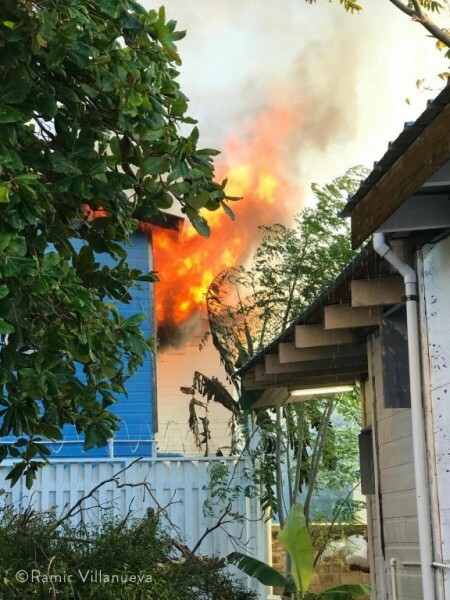 However, Benisford Matura, Operation Officer of the Fire Department in Belize City briefly stated that the cause is yet to be confirmed and that officers from the City will be assisting in the investigation. During the inferno, which threatened to spread to other nearby houses, local residents joined the fire fighters to battle the blaze. A bucket brigade was formed, while other residents dampened the surrounding areas near the fire. Fortunately, the fire was contained and no damage to other areas was reported. According to the management of the apartment building, they were not offered insurance, because wooden houses on the Cayes do not qualify for such coverage under some insurance companies. The Sun contacted two of the major insurance companies in the country, and they indicated that insuring wooden homes on the islands is doable. Both companies explained that an inspection of the wooden property is the first step before the structure can be insured. They also indicated that the price is higher than the fee charged for a concrete building. As investigations continue, interested parties desiring to assist the fire victims can contact Lee Vanderwalker at Caribbean Colours at 605-9242. Donations can also be made via Paypal to the account [email protected] .